Fits many digital cameras, phones, etc. Use a USB 2.0 cable to connect your USB devices and peripherals to your PC or USB Hub. This cable has a standard USB type A Male connector, which plugs into the PC or Hub, and a mini USB Male connector, which plugs into your USB device. Both the 4-pin and 5-pin Mini Male connectors are available. Depending on the device, the 4-pin connector may be called a "Type A Mini USB", or just a "4-pin Mini USB." Similarly, the 5-pin is sometimes called a "Type B Mini USB", "Mini-B USB", or just a "5-pin Mini USB." These cables with Mini connectors are commonly used for digital cameras, PDA's, MP3 players, GPS devices, mobile phones, etc. 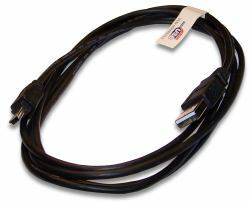 These cables are compatible with USB 2.0 standards and backwards compatible with earlier standards.